In 2016, Adventist Health began delivering healthcare services to Whole Foods' employees in Southern California. The partnership, in which Whole Foods bypassed insurance companies and negotiated directly for services from Roseville, Calif.-based Adventist, gave the organic supermarket chain access to a tailor-made health plan that it couldn't get from the traditional insurance market. Now the 19-hospital system is looking to scale the care navigation expertise developed while caring for Whole Foods employees to its Medicare accountable care organization. Adventist's experience with Whole Foods helped the system develop a new set of skills. The healthy-eating grocer wanted to give its employees access to a more personalized care experience that integrated health coaching and care navigators. Adventist was able to provide that, and in exchange, expanded its footprint and boosted patient volume. Provider direct contracting can give employers more control over the health benefit design and potentially lower the cost of care. "We have a little bit more flexibility as a health system to design around what Whole Foods defines as quality, or what Whole Foods defines as patient satisfaction, which sometimes is different than the traditional definitions," said Dr. Arby Nahapetian, Adventist's chief medical officer for Southern California. Adventist is one of just a few hospital systems participating in a direct-to-employer contract, but with insurers buying providers and pharmacy chains getting into insurance, direct contracting might be an increasingly attractive way for a health system to remain competitive in an evolving market. Direct contracting, in which self-funded businesses eschew insurance companies to partner directly with a healthcare provider, can give the employer more control over the employee health benefit design, and potentially lower the cost of care and improve health outcomes. Currently, only 3% of large, self-insured employers contract directly with an ACO for healthcare services, according to the most recent data from the National Business Group on Health. There are several high-profile examples: Boeing Co., Wal-Mart Stores and Lowe's Cos. are among corporations that have famously shut insurance companies out. 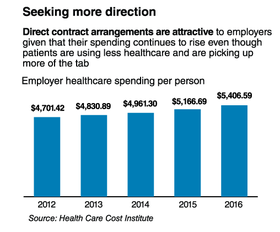 But with employer-sponsored healthcare costs continuing to climb despite the prevalence of high-deductible plans and narrow provider networks, hospital system executives see more opportunity on the horizon for direct-to-employer partnerships as employers look for new ways to bend the cost curve. Meanwhile, healthcare providers—increasingly dealing with competition from all sides of the industry—are all too happy to take the employers' business and cut middlemen out of the equation. "These large providers are thinking, 'Hang on a second, I could get carved out here,'" said Tom Robinson, partner at Oliver Wyman, noting the threat that some proposed deals—like the CVS Health-Aetna merger and UnitedHealth's steady march into the provider space—pose to hospital systems. Forming a direct-to-employer contract is one form of protection that helps to diversify the provider's revenue and brings in more patients, he said. Without an insurance company standing in the middle, many providers feel better able to care for their patients. Doctors have more flexibility to order the tests or specialty care that they believe is necessary for a patient's treatment without having to fight through red tape, particularly in direct-to-employer contracts that do away with prior authorization. As an employer's chosen provider, the hospital or ACO benefits from a guaranteed group of patients with known health risks and costs. The provider gets the opportunity to leverage infrastructure that it has already spent time building. And in many cases, providers are able to share in savings if they end up delivering care at a cost lower than the employer budgeted. That's the case with Presbyterian Healthcare Services' contract with computer technology giant Intel Corp. Albuquerque-based Presbyterian in 2013 entered a shared-risk, value-based direct contract to provide services to workers at Intel's Rio Rancho, N.M., manufacturing facility. Presbyterian is held accountable for hitting key quality and financial metrics, which include targets for patient satisfaction, access to care, and health and cost outcomes. It receives a bonus if it meets those goals and Intel's benefit costs stay under a set target. Presbyterian is also dinged if costs exceed the target. Hitting those targets isn't easy, said Dr. Jason Mitchell, Presbyterian's chief medical officer. The partnership reached all of its goals in the first year except for its cost targets. Even so, the direct contract allows Presbyterian to innovate and "to fine-tune (its) services to meet the needs of the future, because healthcare more and more is going to be designed to meet the needs of the purchaser and the patient," Mitchell said. 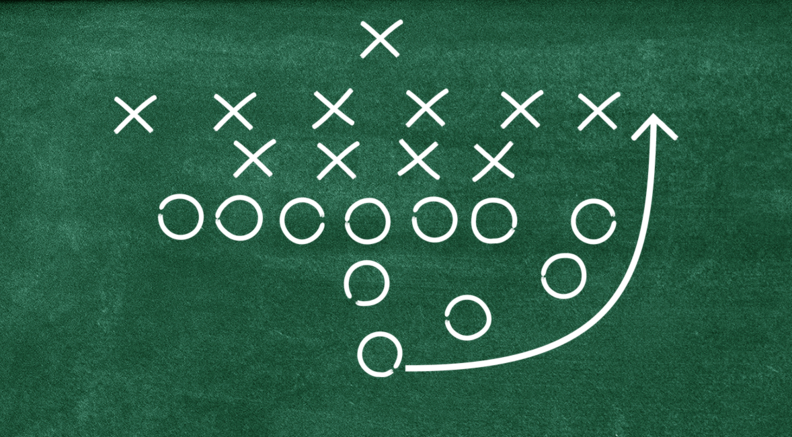 While direct-to-employer contracts are an attractive play on the surface, they're difficult to set up and administer. Employers typically need to have at least a few thousand employees concentrated in one area, and hospital systems need a large physician network and a breadth of ambulatory and specialty-care services, said Steven Valentine, vice president of strategic advisory services on the West Coast at consultancy Premier. Not all of direct contracts have been glowing successes. The Providence-Swedish Health Alliance, a Seattle-based ACO that partnered with Boeing Co. in 2015 to deliver services to its Puget Sound employees, dropped out of the deal this year because the contract wasn't financially sustainable, explained Dr. Rhonda Medows, Providence St. Joseph Health's executive vice president of population health. Medows said Providence had difficulty capturing enough data to anticipate and manage the cost of care. However, from the Boeing experience, the system learned better ways to coordinate care, improve customer experience, and collect and analyze patient data. It's applying those lessons to other value-based care arrangements with employers and payers, including a contract with Intel in place since 2015, and is in talks with other employers about potential direct contracts. Danville, Pa.-based Geisinger Health System's direct-to-employer approach takes the shape of a center of excellence program. The system partners with a consortium of employers including Lowe's, Wal-Mart, JetBlue Airways Corp. and others for specific procedures, including spine, bariatric and cardiac surgeries. The employers give their workers incentives to choose Geisinger for those surgeries, sometimes covering the entire cost of the procedure and travel expenses for their workers. Employees who choose to go outside of the narrow network pay a significantly higher portion of the costs. Geisinger benefits from seeing more patients and receiving a bundled payment for the surgeries, which pushes the system to get the care right every time, said Dr. Jaewon Ryu, Geisinger's chief medical officer. "There's a rigor that comes from being selected as one of these centers of excellence," Ryu said. "We like having that rigor applied. It keeps us on top of our game, and it keeps us on our toes for all the rest of the surgeries we do."